We at Better Carpet Care use the most thorough carpet cleaning method there is. Some cleaning methods use chemicals that leave a residue on your carpet and cause rapid re-soiling. Our method doesn’t leave any residue and is very powerful. It cleans way down to the base of your carpet removing harmful dirt and bacteria, leaving a fresh, clean, healthy carpet which will look good for a long time. In fact at the time of writing we use the best, most powerful equipment on the market and certainly the most efficient in the region. The price I quote you is the price you pay! Unlike other less scrupulous (or should that be more unscrupulous?!) 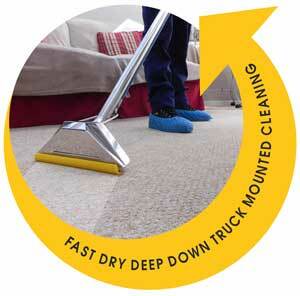 carpet cleaning firms we do not “Bait & Switch”. What’s “Bait & Switch?” Well many carpet cleaning companies will offer you the ‘Bait’ of a low price or compete with a seemingly better price then ‘Switch’ to a higher price once you have let them into your home saying something like your carpet isn’t responding and needs different chemicals or such like. If you fail to bite and pay the extra they do a quick superficial job leaving the carpet only a little cleaner than it started out. I promise no high-pressure sales and no hidden costs. The prices we quote you are fully inclusive.